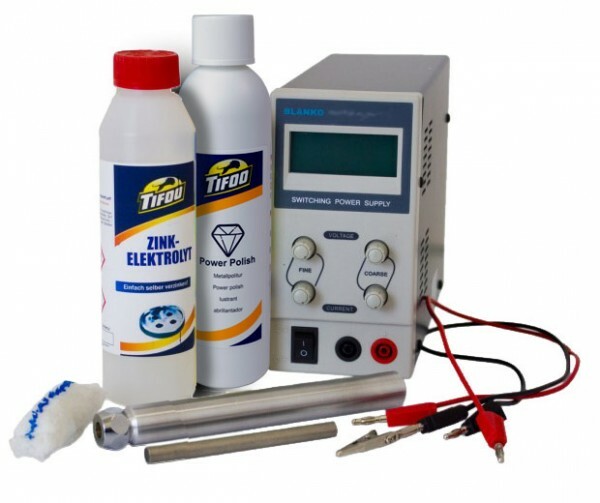 Product information "E-Zinc - Full set"
The E-Zink full set from Tifoo allows you to easily galvanize vehicle parts and many other things. Galvanizing is the perfect corrosion protection for further painting and is the perfect rust protection for iron metals. The included power supply allows you to adjust and regulate the needed current intensity for achieving perfect results, which can't be achieved with a car battery. The Tifoo E-Zinc works on sheet metal, bodywork tin and on already galvanized metal sheets. Galvanizing with E-Zinc is the perfect etching primer for every varnish, offers rust protection and can easily be painted on without further preparation. E-Zinc is the best possibility for DIY galvanizing of bodywork metal sheets. With the included Tifoo PowerPolish, you'll be able to make the zinc very bright. Related links to "E-Zinc - Full set"
Instruction manual for Tifoo E-Zinc - Full set as PDF file. Customer evaluation for "E-Zinc - Full set"